Sporadic outbursts of bomb-throwing: Laochra Uladh’s Belfast campaign, 1950-55. 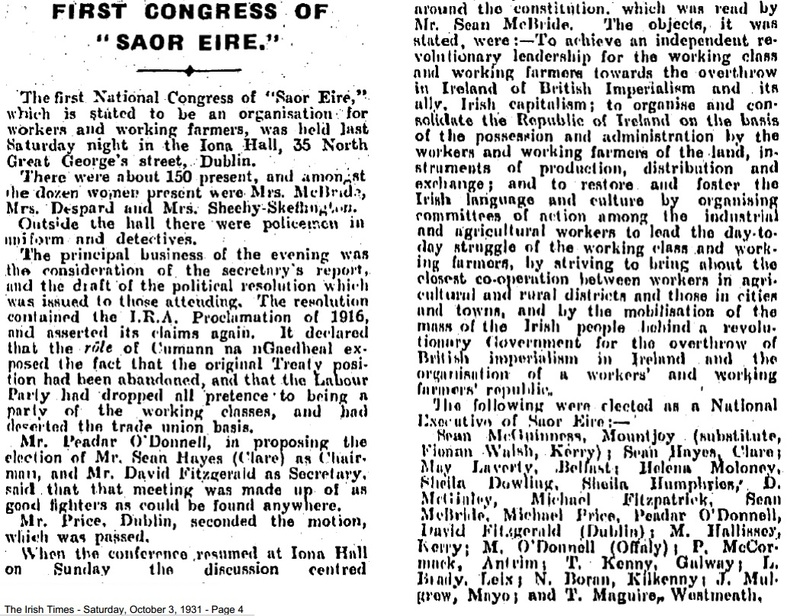 Laochra Uladh was a republican group led by Brendan O’Boyle which was active up to 1955. When he started Laochra Uladh, republicanism in Belfast (and Ireland in general) was fragmented. Commemorations, operations, arrests and weapons finds often involved people and organisations outside official IRA structures. But just as O’Boyle was acquiring money and arms, so too was the IRA establishing it’s pre-eminence in Belfast and elsewhere. By the end of the Laochra Uladh campaign in 1955, the limited number of its operations was now in contrast to the growing activity of the IRA. O’Boyle had joined the IRA in Belfast in 1940, was then interned in 1941, escaping from Derry jail in March 1943 only to end up being interned in the south. After his release from the Curragh he moved to Dublin and began a jewellery business. On a business trip to New York in 1949 he made contact with Clann na Gael, the Irish-American republican support group. O’Boyle suggested he had support at home in Ireland and asked for funding and arms for a new campaign. As the Clann was still officially affiliated to the IRA while O’Boyle was not, he ultimately only received qualified support from within the organisation. O’Boyle had not only been interested in creating his own organisation, though, as he reportedly tried, unsuccessfully, to pressurise younger IRA members into supporting him to be installed as IRA Chief of Staff. Before O’Boyle’s visit to New York, Clann na Poblachta, the political project of Sean McBride and other IRA veterans, had been instrumental in the formal declaration of a republic in the south in 1949. The creation of the vague non-party Anti-Partition League was further sharpening the focus on the north and away from challenging the legitimacy of the authority of the southern government. In the late 1940s and 1950s a series of republican groups had been formed as alternatives to the IRA including an Irish Republican Brotherhood in Dublin in 1950-51, Liam Kelly’s Fianna Uladh in Tyrone in March 1952 (and Saor Uladh from 1954), Raymond Ó Cíanáin’s Arm na Saoirse, Gerry Lawless’ Irish National Brotherhood/Irish Volunteers and Joe Christle’s group in 1955, all in Dublin (most of these are discussed in Bowyer Bell’s The Secret Army: The IRA). These groups were mostly disbanded by, or absorbed into, the IRA. The wider global backdrop of anti-colonial campaigns against Britain, including Palestine, Malaysia, Suez and others were taken as evidence that the methodology advocated by O’Boyle and others could bring success. In August 1949, O’Boyle spelled out his requirements to those willing to listen in Clann na Gael: $10,000, five hundred Thompsons, rifles, grenades and ammunition and the necessary intelligence and support structures for a campaign against the northern government. The same month a Northern Action Committee was formed in New York to raise funds and procure the arms. The committee included the likes of Paddy Thornbury, a former O/C of the Belfast IRA in the 1920s (these details are largely drawn from Tim Pat Coogan’s account in The IRA). O’Boyle had the right contacts and flair to smuggle weapons into Ireland, despite being under surveillance from the IRA to whom he lost the occasional shipment. It isn’t entirely clear which actions in Belfast or arrests should be associated with Laochra Uladh. There had been a cluster of bomb attacks on the RUC in 1950, none of which had been organised or authorised by the IRA. This included blasts at the Springfield Road (8/3/50), Roden Street (10/3/50), Kane Street at the Bombay Street/Cupar Street junction (30/3/50) and the Cupar Street/Falls Road junction (2/4/50). In each case a bomb was thrown, injuring RUC Detective-Sergeant Peter Heverin at Springfield Road, a workman at Roden Street, RUC Sergeant Denis Sweeney in Kane Street and another RUC man and workman at Cupar Street (see contemporary newspaper reports). The fragmented landscape of republican politics in Belfast was evident at the Easter Rising commemorations in April 1950, as there were at least three separate events held. During May 1951, an extraordinary army convention had been held to resolve internal wrangling and confirm the effective leadership of the IRA and Sinn Féin as Tony Magan, Patrick McLogan and Tomás MacCurtain. On paper, coalescing with Sinn Féin looked like the IRA was moving more towards politics and away from military activity. That army convention was immediately followed by a number of attacks by groups outside the IRA, clearly intent on making a claim to the IRA’s military role. In the first, the group calling itself the Irish Republican Brotherhood threw a bomb at the British Embassy in Dublin. Then, early on the morning of the 28th May, the RUC found a home-made bomb alongside the wall of Cullingtree Road RUC barracks in Belfast. The bomb was moved into the road and examined. It was found that the fuse had actually failed and prevented the bomb detonating. This was the first recognisable attack involving the night-time placing of timed charges against the walls of target buildings. Later attacks using the same method were to be claimed by Laochra Uladh in 1954, suggesting a possible overlap in personnel (if nothing else). Whether Laochra Uladh was also behind the 1950 attacks isn’t now clear, although it is possible that all effectively were associated with the same pool of individuals. The Cullingtree Road bomb may also have been intended as a demonstration to O’Boyle’s Northern Action Committee backers in New York as well as conveniently open defiance of the IRA’s March statement and its apparent strategic move towards politicisation at the May army convention. There was no answer forthcoming from Stormont, but there was from the IRA the same day as the first in a new campaign of official operations began with a raid in Derry (on 5th June 1951). 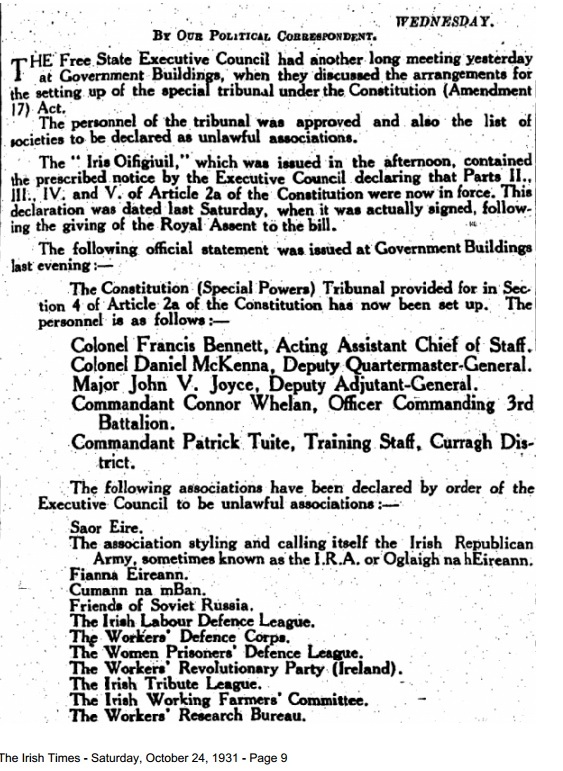 Publishing of the IRA’s newsletter to its volunteers, An tÓglach, then re-started in July 1951. On 26th July, 1951, an apprentice electrician, Patrick Fagan, was bound over for three years due to his age (17) having been found with two revolvers, a Colt automatic pistol and 31 rounds of ammunition as well as documents confirming the Belfast IRA was organised, re-arming and training in line with the directives after the May army convention (see Irish Times 9/6/51; and 26/7/51). A Belfast-based republican newspaper, Resurgent Ulster, was also launched and its first edition issued in November 1951. From April 1953, Resurgent Ulster was produced in a more professional looking format, alongside the start of preparations for the 150th anniversary of Robert Emmet’s rebellion. In Belfast, the commemoration committee encompassed a wide breadth of nationalist organisations, including the GAA, National Graves Association, the Pre-Truce IRA Association and the Gaelic League. The IRA had also established hegemony over other republican and nationalist organisations in being visible in the lead role for a unified 1953 Easter Commemoration (in contrast to the three separate commemorations in 1950). The IRA and Sinn Féin again publicly clashed with the northern government over another British royal visit in May 1953. On the night of the 19th June a loud explosion rocked Cullingtree Road RUC barracks between 12.30 and 1 am. RUC Constables on duty rushed out to find a hole in the wall of the barracks facing onto Murdoch Street. The bomb had been placed in a ventilator beneath a window in the wall. This was the same method, a bomb set on a timer to detonate during the night that had been used against Cullingtree Road Barracks on 28th May 1951 and was to be used repeatedly by Laochra Uladh in 1954 and 1955. Harry Diamond, the Stormont MP for Falls, claimed he had found no proof that republicans were responsible for the blasts which he said were carried out by the RUC or B Specials as a pretext for the subsequent repression. That may indicate that Laochra Uladh, if it was responsible, was never more than a small group. Damage done by the blast in Cullingtree Road on 19th June 1953. In the days following the blast, Billy McMillen and Liam McBurney were up in court over incidents in May and received several months in prison. During this period the IRA were also successfully carrying out other arms raids, including in Belfast (e.g. see Anderson’s 2002 biography of Joe Cahill, A Life in the IRA). Judging by the role taken at the Robert Emmet commemorations that took place in October 1953 and the Easter commemorations in 1954, the primacy of the IRA among republican groups in Belfast was confirmed. Outside the city, Liam Kelly had been elected to Stormont for Fianna Uladh in October 1953 and had been arrested in December, receiving a year in prison for making a seditious speech. Sean McBride was then instrumental in getting Kelly a seat in the southern senate in 1954 and it seems the Fianna Uladh group had acquired some high level political backing in the south. By the summer of 1954, having received weapons and up to $10,000 from Clann na Gael, there must have been pressure on O’Boyle to mount a more substantive campaign, particularly after the IRA’s successful raid on Gough barracks in Armagh in June. On Tuesday 17th August, a bomb was placed at the headquarters of the Royal Artillery on the Antrim Road in Belfast. The bomb had a timer and was packed with high explosives. The British Queen, Elizabeth was due to visit Belfast that day. The RUC searched the Royal Artillery’s premises but found no trace of the bomb or evidence of its impact after detonation. On the Wednesday, a caller to the Evening Herald’s office in Dublin claimed that members of Laochra Uladh had planted the bomb in protest against the royal visit. They claimed that the bomb was “timed to explode at 3.30 am to avoid loss of innocent life.” On 11th October 1954, there was an explosion in the grounds of Cloona House in Dunmurry which again carried all the hallmarks of Laochra Uladh. A bomb, set on a timer, exploded on a path adjacent to the house. The house was occupied by Lt-Gen, Sir John Woodall, the Officer Commanding for the British Army in the north. Woodall was at home at the time but was uninjured. In the October issue of Resurgent Ulster, the IRA leadership in Belfast was highly critical of comments made by Liam Kelly in Tralee which were taken to denigrate northern republicans. By this time Kelly was publicly claiming to be building up an army of his own to be used “when the time came” (eg see Irish Times 25/11/54). Kelly was now, too, in direct competition with the IRA. On October 17th, the IRA, mainly volunteers from Dublin and Cork, had mounted an arms raid in Omagh which led to the capture of eight of those involved. Their trial ran through the news in November and December of 1954, with some then standing in the upcoming Westminster elections in May 1955. The public disclosure of arms raids by the IRA went some way to undermining the perception being promoted by Fianna Uladh (and the actions of Laochra Uladh) that the IRA was inactive and, more so, hinted at preparations for a forthcoming IRA offensive. The IRA volunteers captured in Omagh remained in the public eye as they became a significant focus of attention in 1955, ironically, drawing out electoral support for Sinn Féin in the May elections. Meanwhile, the Laochra Uladh campaign continued. A report given to the press in Dublin on 8th November 1954, claimed that the organisation had planted another timer-bomb on the night before. On this occasion, the target was stated to have been the British Ordnance Depot in the former airfield at Long Kesh. The British Army dismissed the report and denied that this incident ever took place. Laochra Uladh then mounted another attack on December 14th 1954 when two loud explosions were heard during the night, at 1.30 am and 1.45 am. The source of the first wasn’t clear but the latter was clearly at Jackson’s Road alongside Palace Barracks in Holywood. In the morning it was found that gelignite had been placed against the barrack railings and a grass bank (eg see press on 15/12/54). When they exploded there was little significant damage. Clearly, the IRA was not going to cede ground to either Saor Uladh or Laochra Uladh. Perhaps under pressure due to the lack of action, on Saturday 2nd July 1955, Laochra Uladh mounted a further attack. This time the intended target was the telephone exchange at Stormont. The odd nature of Laochra Uladh is shown by Brendan O’Boyle’s choice of companions for the attack. Originally, he was to be accompanied by a couple who were neighbours of his in Dublin. At the last moment, his wife, Carmel, took the place of the wife in the couple and the three travelled to Belfast in a newly-imported car O’Boyle had borrowed from a car dealer called George Whelan. When they reached the Belmont Road the neighbour and O’Boyle’s wife Carmel got out of the car and walked up the road. O’Boyle had 1lb of high explosives and a detonator on the floor in front of the passenger seat. He appears to have been bent over the explosive device, priming it to make it ready, when it detonated prematurely. The car roof and passenger side doors were blown off, scattering debris over a 30 m radius. The blast blew off O’Boyle’s right hand and right foot and reduced his face to a pulp. Carmel and the neighbour were close enough to the car for Carmel to have been injured by the blast. William Ferns, the gate lodge keeper at nearby Victoria Girls Home was first on the scene and found O’Boyle gasping and moaning. This continued for a few moments before O’Boyle died. The driver and conductor of a passing trolleybus also arrived very quickly and they noticed Carmel, bleeding from the face, being led away by the neighbour who was telling her “Come on now, you will be alright. Don’t look back.” Carmel went straight to O’Boyle’s mothers house and, from there to hospital where she was arrested. The neighbour managed to return to Dublin whereas Carmel was later released without charge (eg see Irish Times 4/7/55). The Laochra Uladh campaign died with O’Boyle. The main beneficiary seems to have been Liam Kelly’s Saor Uladh to whom the Northern Action Committee switched allegiance after O’Boyle’s death. Saor Uladh appears to have received around $5,000 and gained access to the arms received by Laochra Uladh. It was to remain active during the 1956-62 Operation Harvest campaign after which it was largely absorbed back into the IRA. There was no lasting enmity between O’Boyle and his former colleagues in Belfast. In 1966, when Jimmy Steele and the National Graves Association produced Antrim’s Patriot Dead, O’Boyle was given an entry, although he was stated to have ‘severed his connections‘ and was carrying out what it describes as ‘unofficial operations‘. 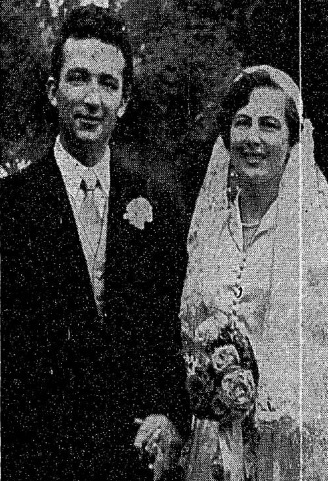 Brendan and Carmel O’Boyle on their wedding day.